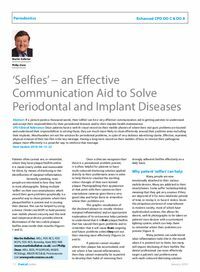 Abstract: If a picture paints a thousand words, then ‘selfies’ can be a very effective communication aid in getting patients to understand and accept their responsibilities for their periodontal diseases and/or their implant health maintenance. Clinical relevance: Once patients have a well-lit visual record on their mobile phones of where their real gum problems are located and understand their responsibilities in solving these, they are much more likely to clean effectively around their problem areas including their implants. Mouthwashes are not the solution for periodontal problems, in spite of very dubious advertising claims. Effective, repeated, physical removal of their bio-film is the key message. Having a long-term record on their mobiles of how to remove their pathogenic plaque more effectively is a powerful way to reinforce that message. Objective: To recognize how ‘selfies’ can be an effective communication aid in getting patients to understand and accept their responsibilities for their periodontal diseases.